When you are planning a major asphalt paving project, it is essential to make sure that your materials are delivered safely and on time. At Cactus Asphalt, we are pleased to offer quality transportation services to all of our clients. Whether you are in need of tanker transport, heavy haul transport, or spreader trucks, our team can provide transportation services that are targeted to your needs. Read on for an overview of the asphalt transport services that we have to offer you. 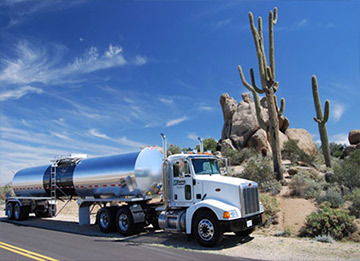 If you are planning on transporting materials that are perishable, hazardous, or otherwise sensitive, you may want to inquire about the tanker transport division at Cactus Asphalt. We employ a fleet of specialized tanker trucks that are equipped with a full range of safety equipment. Additionally, we guarantee that all of our drivers are fully licensed and certified to drive tanker vehicles. Sometimes, heavy duty equipment needs to be transported long distances. When you are gearing up to transport large machinery or other equipment, it is a great idea to hire our fleet of heavy haul transport vehicles. Our team is fully knowledgeable about all regulations regarding the transport of heavy loads, and we will make sure that your equipment arrives to its destination on time. During an asphalt pouring project, our computer rate controlled spreader trucks can be an asset at your jobsite. Using our rubberized asphalt trucks, we can hold and pour large volumes of asphalt to create surfaces in a variety of dimensions. From major spreading jobs to minor asphalt projects, we have experience with all types of spreading services. For more information about the transportation services that Cactus Asphalt has to offer you, give us a call at (623) 207-8246. From asphalt paving state-wide to tanker transportation and more, we are pleased to provide our customers with a variety of quality services. Contact us to set up your transportation services today.